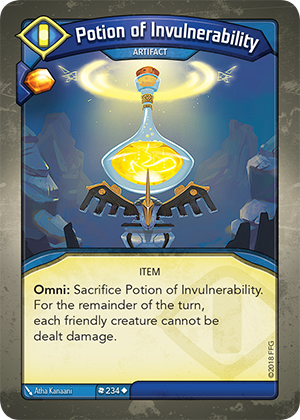 Card Text Omni: Sacrifice Potion of Invulnerability. For the remainder of the turn, each friendly creature cannot be dealt damage. Does Potion of Invulnerability’s “Omni:” ability affect friendly creatures that are played after using the ability? Yes. Potion of Invulnerability’s ability creates an effect that persists through the end of a turn, affecting all friendly creatures. There are no other limitations or restrictions on the scope of the effect, including the time those creatures are played.